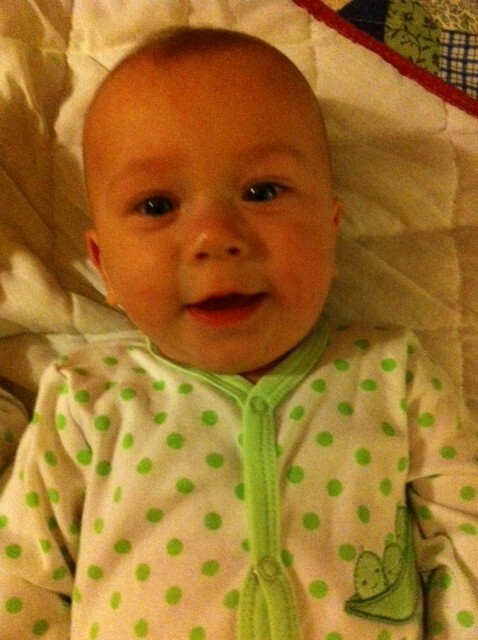 One of my favorite times is at night when we are doing the night time ritual preparing the girls for bed and we get what Bryan calls, “Jamma-fied.” Code for “getting in our PJs.” Here are a few cute jammie pics that were taken recently. 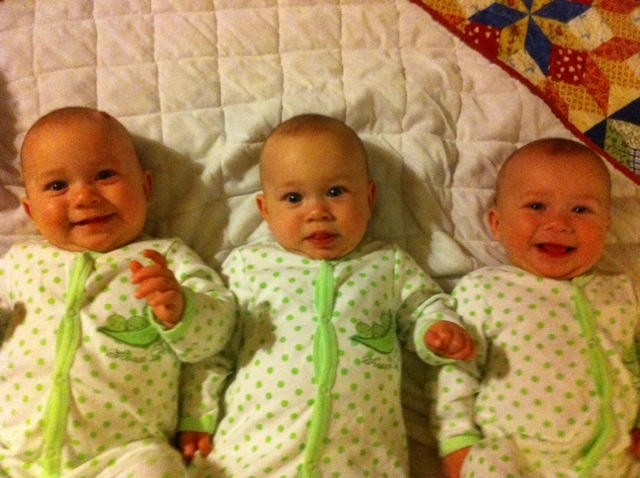 The one the girls have on green and white polka dot jammies and it actually says Peas in a Pod on it. The girls have been rock stars sleeping through the night. I am still amazed at how far we have come. Bryan and I actually have two hours to ourselves at night to just chill out and watch TV. Thank you girls! The girls just turned 7 months old! I can’t believe it. 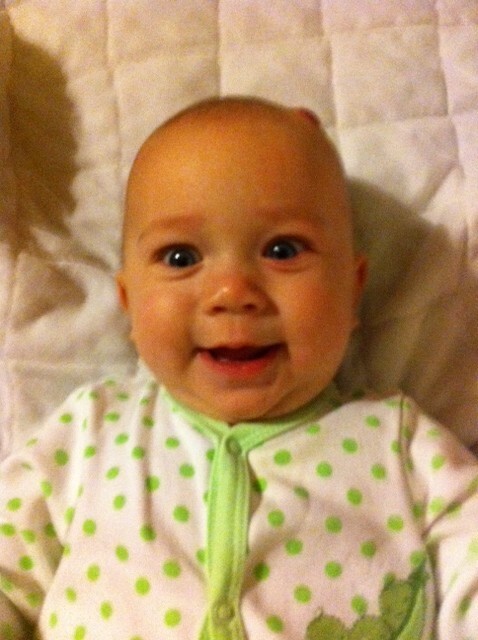 Here is Camdyn. This is a new thing that cracks us up. She smiles with her mouth wide open! I keep thinking that I maybe make that face at her and she is mocking it right back to me. Its like an annoying cheerleader type face, but it sure makes be laugh every time! Here is Miss Em. Sweet as can be. I swear this girl is happy most of the time. 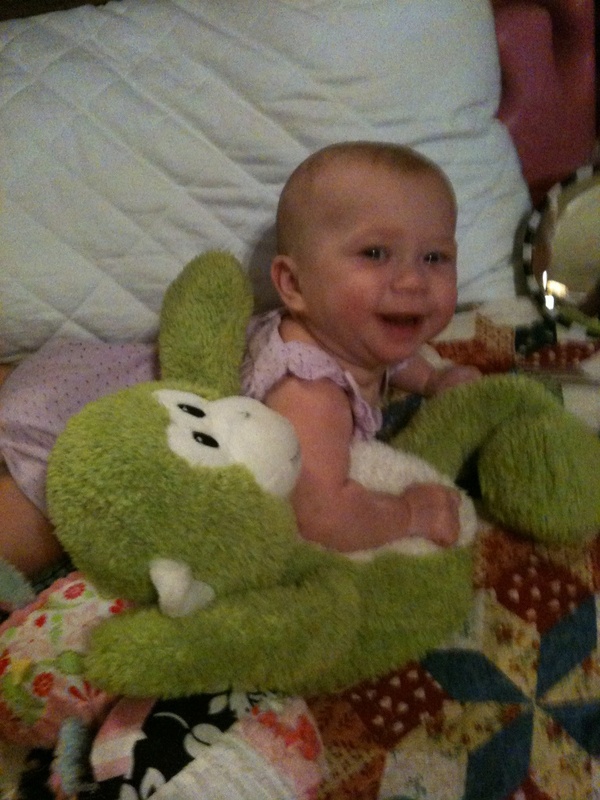 And here is Avery. We actually got her smiling. 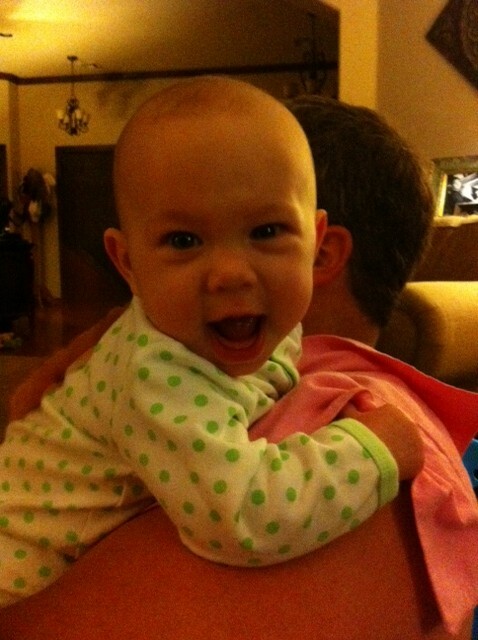 She is a happy baby, but she is the serious one out of the bunch. Probably gets that from me. Here are some other new pics that are funny. 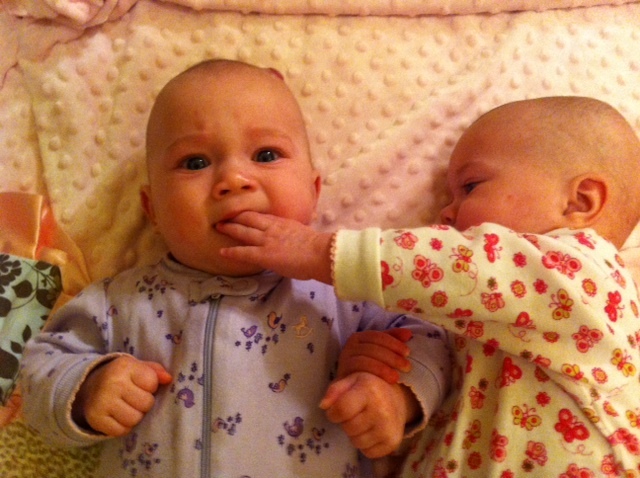 One you will see Emily sticking her hands in Avery’s mouth. This is becoming more typical. There are hands and feet everywhere these days! 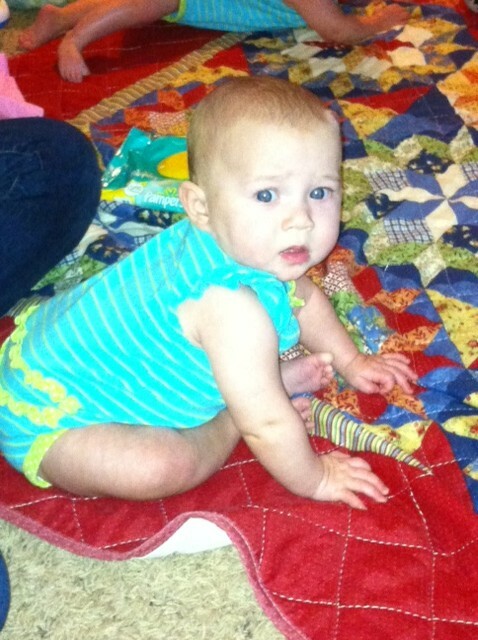 The other is Camdyn and Emily just hanging out…In PJs again. I think I catch them before bed and right after they wake up for good pics. I will leave everyone with one of my “Strangers say the weirdest things about triplets” latest story. Its actually a good one! Young Boy about 9 years old: “Man, that is a weird stroller.” – That made me laugh. Weird lady in department story with mid-drift showing out her shirt: “My ex-daughter in law had a premie and it was like 1.5 pounds. I said, “No way, put that baby back we don’t do babies that small.” – I really have no comment to this…I don’t think I need to. Finally, sweet lady who is a new grandmother to twins. Hope everyone has a triple blessed week!!! 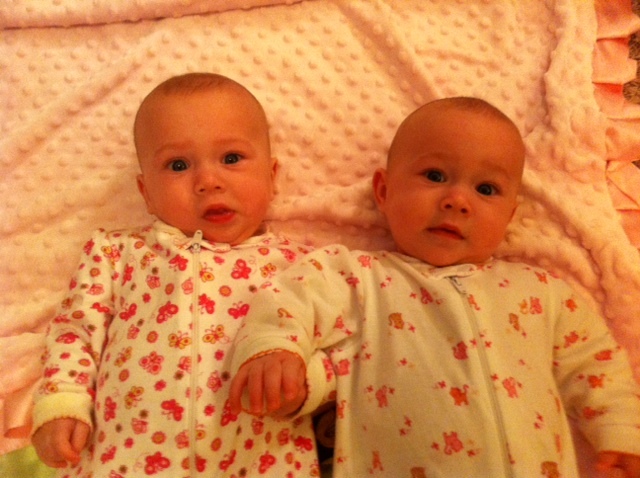 Man those are some cute baby girls! I am so glad your getting some relax time! I love the look on Avery’s face with Emily’s hand in it! My goodness what a difference 7 months makes. 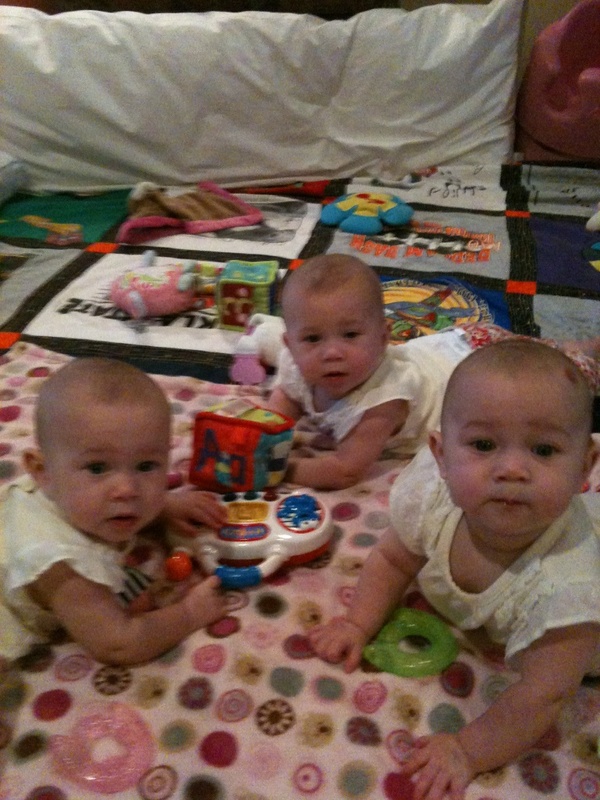 I love looking at your sweet girls!!! They are so adorable!!! You are triple blessed. Isn’t it strange how people will react with “oh, you poor thing”. What is wrong with these people who see children as a problem and not a blessing…. They really are growing up so fast! I need to bring Bailey to see them….she would just go crazy!